Source to Sea project Cape Town. Photo from Source to Sea website. Welcome to the first FRACTAL Learning Theme on Adaptation Inspiration delivered through WhatsApp! establish a community of practice to share knowledge and learning? 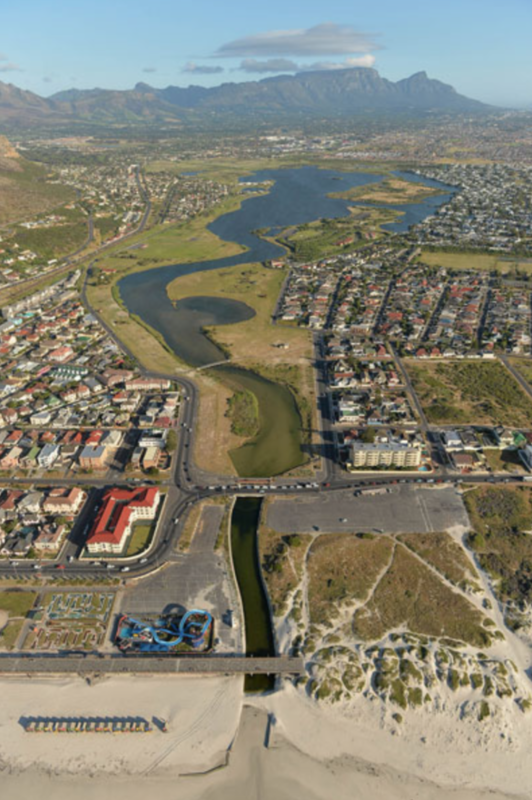 The Adaptation Inspiration theme is informed by cases collated from FRACTAL partners as examples of good practice in urban adaptation in Africa. The cases cover a range of approaches to adaptation and urban challenges to a range of climate hazards and other stressors. Solutions also address several of the UN's Sustainable Development Goals. Lesotho: an assessment of future national water management developed as part of the 2016 Lesotho Water Security and Climate Change Assessment. Participants of the WhatsApp training will receive a WhatsApp message and a link to the latest module every week for six weeks. Participants can study the cases and resources, address questions posed and join in the online discussion through the forum located beneath the cases. The more you engage with the content and discuss with others taking the module, the more you will learn! In order to contribute to the discussions, you will need to register and login. These buttons can be found at the top right corner of the weADAPT screen. We would be delighted to receive your feedback regarding the modules, platform and the process, therefore there will be an opportunity at the end of this training theme to complete a simple survey to give feedback. The need for climate change adaptation has been recognised in developing countries since the early 1990s. The 2015 Paris Agreement provided renewed enthusiasm for addressing the issue. In addition to requiring all countries—not just developing ones—to undertake National Adaptation Plan (NAP) processes, the Paris Agreement also calls on countries to improve the “effectiveness and durability” of their adaptation actions. Despite significant advances in adaptation in Africa and the recognition that adaptation is fundamentally about risk management and can have immediate benefits for reducing the impacts, there remain challenges related to access to data, planning at an unsuitable scale and integration across sectors. ‘No regrets’ or ‘low regrets’ measures such as increasing access to information and resources, improving health services, diversifying cropping systems, strengthening access to land, credit and other resources for poor and marginalised groups and making water and land management and governance more effective are good for development, irrespective of changes in climate (ODI and CDKN, 2014)*. The focus of this training theme is the African continent’s urban adaptation. The continent will lead the world’s population growth over the next 50 years. Moreover, ‘the people of Africa will increasingly be city dwellers’ meaning that ‘Africa will have some of the largest mega-cities in the world’ (African Development Bank, 2014)*. While no continent is immune to the impact of climate change, the African continent in general, and Sub-Saharan Africa in particular, face a particularly broad array of environmental issues including: increased water stress, higher risk of coastal inundation, changes in river hydrology, increased exposure to infectious disease, and alterations to the magnitude and frequency of extreme events. The case studies highlighted in this theme are intended to provide practical options to inspire national and municipal governments, city planners, NGOs, private companies, international institutions, and communities to take action to implement further adaptation projects on the continent. What are your (personal) learning objectives? Post a comment in the discusson forum below with what you hope to learn over the next six weeks. *CDKN/ODI (2014) The IPCC’s Fifth Assessment Report | What’s in it for Africa? I am excited that this FRACTAL Learning Theme has started and I am looking forward to hearing about examples of inspiring adaptation actions and ways of managing climate risk in cities across Africa. My country Botswana is prone to climate change due to its fragile environments and semi-aridity. Adaptation is hence vital given the above conditions. I am looking forward to hearing real world examples of adaptation good (and bad) practice. Fantastic Dimpho Motshabi, looking forward to hearing from Botswanas perspective. Brilliant Moonga Chilanga, sharing your knowledge from the Disaster Risk Reduction project in Lusaka is going to add much value to the learning group over the weeks. Keep sharing. Currently there is no legislature in Zambia to control use of ground water. It is a free commodity and easily accessible. I do not know exact statistics but I think more than 70% domestic demand of water is met by ground water. I would like to see how FRACTAL can make an impact in managing ground water efficiently. Lesotho experience might be useful for Lusaka as well. This training programme was open to community planners and decision makers in developing countries and included a 4-week intensive course in Sweden and follow-up work in the home country. This session explored the links and differences between adaptation and development.